I got my new U.S. passport in the mail last week and sent it off to get a visa for my trip to China next week. Passport pictures are inevitably unfortunate, of course. With my sabbatical coming up next year and an around-the-world journey planned, I asked for a 48-page version rather than the standard 24-page issue. I was a few months too early to get the new high tech passports, which have an embedded chip that supposedly will make it even easier to get through immigration lines at airports and such. 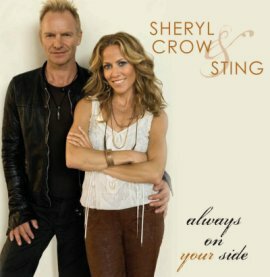 Sting recorded a vocal track to enable Sheryl Crow to release a duet version of "Always On Your Side," a song from her solid last album Wildflower. The addition of the former Police frontman's vocals made this a much better song. It's available as a download on iTunes. The supposedly unassailable Roger Federer looks like he has a real rival. 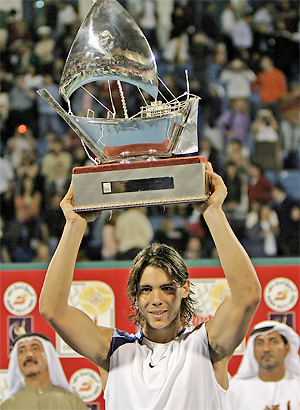 Young Rafael Nadal is now 3-1 against the Swiss #1, with a three-set win in the Dubai final this weekend on a hard court. Can it be that the #2-ranked Spaniard has Federer's number? Roger is on record saying he hates playing against the left-handed angles Nadal generates with the ferocious forehand. 2006 could be an interesting year with this rivalry blossoming. 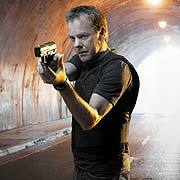 Two episodes of 24 tonight. Great season so far! 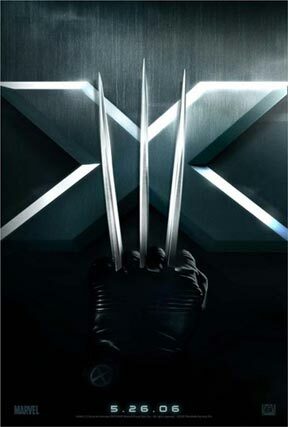 The trailer for the third X-Men flick, coming out in May, aired during last night; it also has been posted here. I am heading off to Kennedy Airport for the long flight to Beijing. 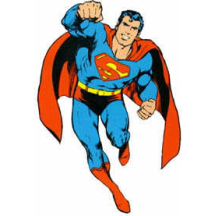 My flight departs at 3:30 and arrives at 6pm tomorrow. Of course, most of that time differential is crossing the International Date Line. Actual flying time is 13.5 hours. 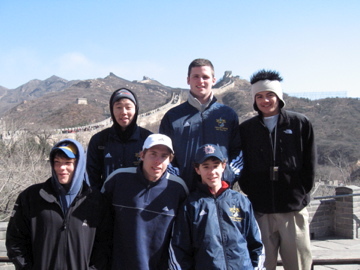 After 13 hours in the air, the Choate Tennis group arrived in China. After clearing immigration and customs and meeting the rest of our party and our guide, we were taken straight to a Chinese restaurant for dinner. The traditional food turned out to be better than I had expected. Our accommodations are at Capital Normal University; our rooms are sort of a cross between dorm rooms and hotel rooms, but comfortable enough. There's television here, but no channels in English. Today was a sight-seeing extravaganza: the Summer Palace, Tiananmen Square, the Forbidden City, and an acrobatic show in the evening. Interspersed between these sights were traditional Chinese meals and some shopping stops. 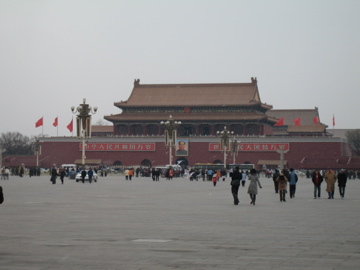 Overall impressions: Beijing is a BIG city--one that sprawls outward rather than upward. And Mao must be rolling over in his mausoleum now that everyone in the country seems determined to make a buck (or a yuan), especially from Western tourists like us. The street vendors are relentless, offering knock-off watches and Chinese army hats. We headed north to Badaling to check out the Great Wall this morning. The conditions were windy and frigid, but it was a pretty cool spectacle nonetheless. Back in the city, we visited the Temple of Heaven and had a Peking duck dinner (overrated!) and then watched/slept through a kung fu show that was pretty cheesy. We left Beijing this morning and arrived in Shanghai in the early afternoon. We settled into our pretty plush accommodations at the Shanghai Racquet Club, an expat community on the outskirts of the city and had some on-court time. This place has all the comforts of home: Western-style food (we had a late dinner at a nearby Papa John's Pizza! ), Internet access, and satellite television with a slate of English-speaking options. After a morning routine of tennis training, the boys and I were taken by our hosts, the Jia family, downtown in the late afternoon. We all got measured for bespoke suits at a tailor shop (about $75 apiece--a tremendous bargain), took some group pictures on the Bund, had a great jiaozi meal, and shopped for cheap (a.k.a. pirated) DVDs in the Gubei district. I picked up the recent releases Elizabethtown and Pride and Prejudice, which I missed in the theaters, as well as Indiana Jones and the Temple of Doom--all for less than $2 per disc. (I already own the latter, of course; I got another copy just so I could watch the Shanghai scenes again while I am here.) I also bought seasons 1 through 3 of Nip/Tuck, which I have never seen, but understand is quite good. That set me back about $15. While the boys were training, I went into Shanghai for a while this afternoon. The SRC, where we are staying, runs a free shuttle service into the city. It takes about an hour to get to the heart of town. I spent a few hours cruising around Huaihai Road--a major shopping district. Though I bought nothing, it was good to hit the pavement and get a better feel for the city. 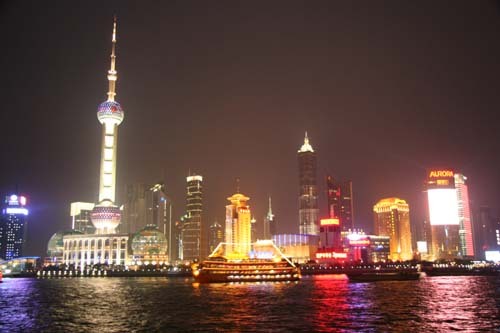 In many ways, Shanghai feels like a perfectly modern, economically prosperous city. The language difference obviously gives the place a different vibe than one would find in America or Europe, but I easily could have imagined I was in a Japanese city without much trouble. 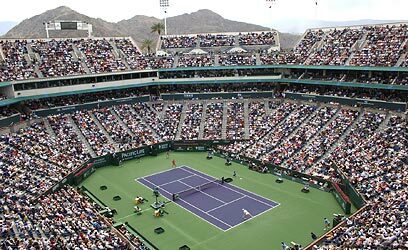 I've been able to see far more of the Indian Wells tennis tournament on television here in Shanghai--halfway around the world--than I would have back in the States. Live coverage of the event plays throughout the morning on one of the satellite sports channels. The age of globalization is here! I doubt they will be dyeing the rivers green here in Shanghai as they do in Chicago, but it's St. Patrick's Day nonetheless. My dad always told me that there are two types of people in the world: the Irish and those who want to be Irish. 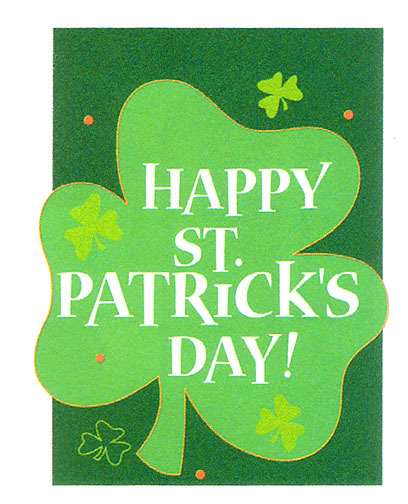 So Happy St. Paddy's Day to all! 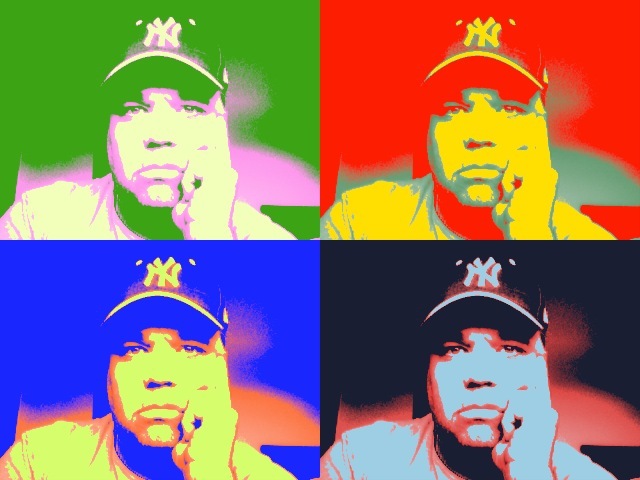 I got a copy of Photo Booth to use with my iSight camera. The application is more or less pointless, but it IS fun! 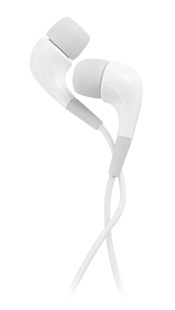 I used the new features in the updated iLife '06 suite--specifically Garage Band and iWeb--to create a pair of podcasts and a new site for the Choate tennis team. Check it out here. About to head to Shanghai Hongqiao Airport for a two-hour flight to Beijing, and then a 13+ hour ride to New York. Including time in three different airports and the ride back to Wallingford, I figure I'll be traveling the next 24 hours. Woke up a bit before 4:00 this morning, having crashed around 7:00 last night. A four-hour nap in the afternoon hopefully has reset my biological clock before tomorrow. While the first day of spring was sunny, it was far from warm back here in Wallingford. As terrific as the trip to China was, I did miss the chance to bask in some sunshine this spring break. Woke up this morning about ten minutes before my 8 a.m. class. As I have getting been up between 3 and 5 in the morning all week before today, I guess it's safe to assume my body is back on Eastern Standard Time. Today was the start of the spring term at school. I am teaching a section of Constitutional Law to seniors and juniors; it's my usual spring elective in the history department. I am also continuing my American Literature class; we are about to delve into The Great Gatsby, one of my favorite books to teach. My 2006 equipment allotment from HEAD arrived today. My new racquet is the Flexpoint Prestige Mid. I'm looking forward to getting the new frames strung and getting out on the court with them this week. 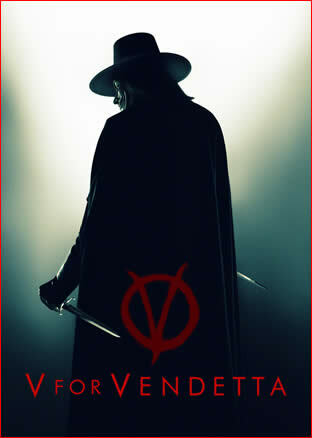 I saw V For Vendetta tonight. It seemed the filmmakers did a pretty good job translating the graphic novel to the screen. The movie has gotten mixed reviews, but I found it entertaining, visually interesting, and provocative. 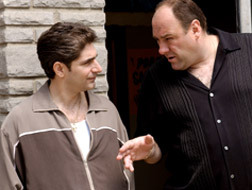 I fired up the DVR today to get current with the new season of The Sopranos. Episode 1 of the sixth season ended with a shocker, and the follow-up dealt with the fallout. It's good to have this show back. For the first time in a LONG time, I saw two movies in one weekend while school was in session. I watched The Inside Man this afternoon, the new Spike Lee-directed film, starring Clive Owen, Denzel Washington, Jodie Foster, and Christopher Plummer. It was an enjoyable movie: tautly paced, cleverly scripted, and well acted--a perfect caper flick! There are 10 different types of people in the world: those who understand binary numbers and those who don't. This page contains all entries posted to As Far As You Know in March 2006. They are listed from oldest to newest.